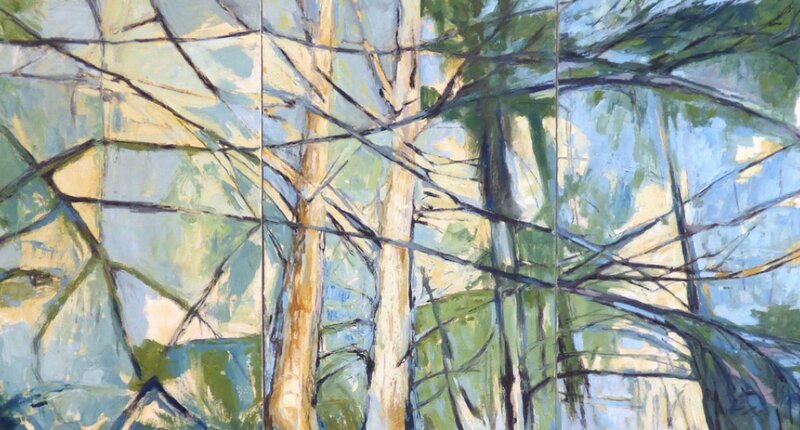 Hart James is a landscape painter who is fairly new to Olympia. Her show at the Washington Center includes 48 paintings spread throughout the lobby, mezzanine and balcony. Most are woodland scenes with dense tangles of trees and patches of sky poking though. In almost every instance the sky seems to advance forward to lie on the same surface as the trees — everything flattened in the modernist fashion. The paint is predominantly a heavy impasto applied with palette knife or other flat instrument, sometimes applied in contrast to lightly brushed background colors. Cezanne immediately comes to mind, and to a lesser degree van Gogh. But her landscapes are not from French woodlands but most definitely the dense forests of Western Washington. One striking exception, however, is a painting titled “Land, Water and Sky — Iceland,” which has an open feel, a windswept ski and colors that are cold as ice. South Puget Sound’s most popular annual art exhibition returns for 2015 and it’s bigger and better than ever. It’s the postcard show. Artists are invited to enter postcard-size works of art. Size is the only limitation, and artists are encouraged to respond to a theme. This year’s theme is “Out of Sight.” No entry is turned down, and artists are encouraged to interpret the theme in whatever way they want, no matter how far out. More than 100 artists are included in this year’s show, most with multiple submissions. The art stretches around three walls of the gallery in three tiers. Paintings by Olympia artist Hart James are now on display in the Washington Center for the Performing Arts, 512 Washington St. SE, Olympia. Three years ago, Hart James was an overworked business owner who dreamed of moving to a beautiful place and pursuing a life as an artist. Today, she’s doing just that — and the place she chose is Olympia.